4. Proof of accommodation in Taiwan. Should you need to stay longer than 14 days in Taiwan, you are still required to secure visa before entering Taiwan. And that's a wrap! Thank you Taipei. I'm sure gonna miss the warm people, super yummy street food and the pleasantly cold weather. Now back to daily grind. My passport is filled with stamps from visa-free countries except on that of Nepal’s which is technically easy to acquire as they have visa-on-arrival policies. My Sri Lankan visa was also effortless to obtain as we applied online and got it within the day. 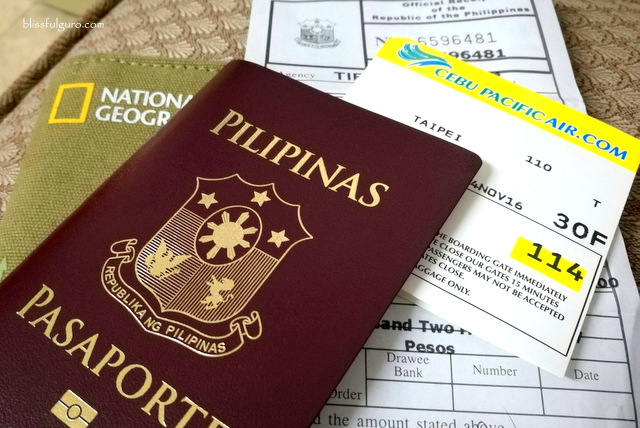 As with Taiwan, there’s a new visa-free policy to enter the country for Philippine passport holders. 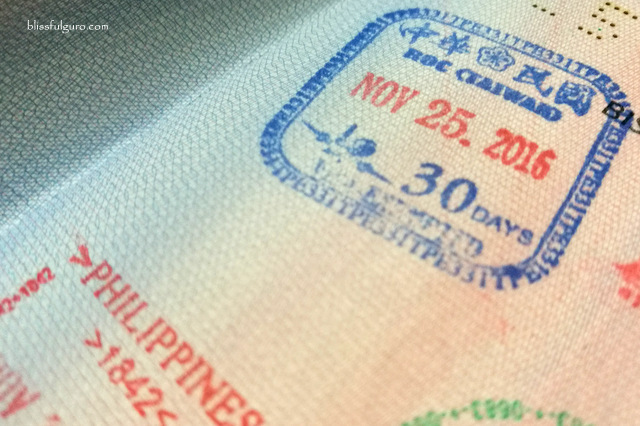 Starting last September 1, 2016, the Ministry of Foreign Affairs of Republic of China (Taiwan) announced a simplified visa policy for citizens of certain countries (Cambodia, Indonesia, Laos, Myanmar, Vietnam and India) including the Philippines which is an extension program that was initiated first in Brunei and Thailand. The dreaded P1,620-Peso travel tax for Filipinos! In the new policy, Filipinos who have a valid entry or resident card visa issued by certain countries may apply for visa exemption. Furthermore, if you have entry visa or resident card that has expired less than 10 years prior to the arrival date in Taiwan, you may also apply for visa exemption (check here for discounted tours, transportation and activities in Taipei). 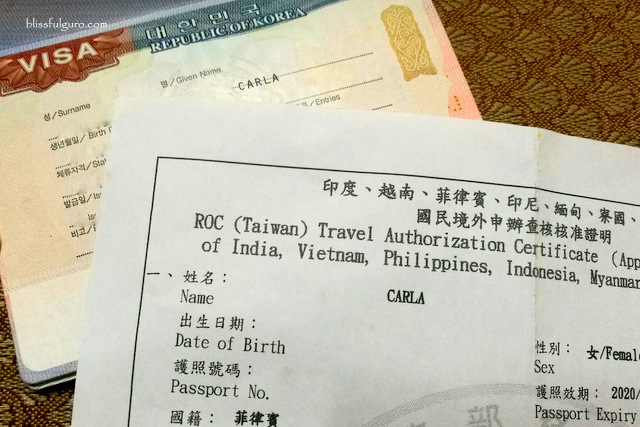 Qualified applicants need to apply for ROC (Taiwan) Travel Authorization Certificate which allows them to have multiple entries for three months with up to 30 days on every stay as long as they have onward/return air ticket and valid Philippine passport. Valid resident or permanent resident card or expired resident or permanent card less than 10 years prior to the arrival date in Taiwan. I have a travel visa for South Korea which I got in November and immediately registered my passport and personal data and in seconds, I received my multiple entry visit visa to Taiwan (take note that the Korean visa number are those numbers on red ink printed below your given name). My friends also applied using their expired Japanese and Schengen visas which all worked fine as well. Moving on, I had a print-out copy of the Travel Authorization Certificate with me at the check-in counter in Manila as well as a photocopy of my Korean visa. Only the certificate and the return flight ticket were asked on the check-in counter as well as by the immigration officer from the airport. Arriving in Taipei, I was asked by the immigration officer for the Travel Authorization Certificate and immediately stamped my passport; easy, cost-efficient and hassle-free. Can't wait to share with you my recent trip to Taiwan on my next posts. Fill out the application completely and legibly. Supply N/A (not applicable) if you have no data relevant to the question or situation. All original documents should be accompanied with photocopies. You may file your application with complete requirements at Taiwan Economic and Cultural Office (TECO) from Mondays to Fridays, 8:45 a.m. to 11:45 a.m. only. Releasing times are on Mondays to Fridays, 1:45 p.m. to 4:45 p.m. only. TECO reserves the right to ask for additional documentation as deemed necessary. The applicant will be scheduled for interview by TECO if necessary. Thank god i found your post bec my wife and I are travelling to taiwan next year. We recently visited Korea this year and while I am aware of this new Taiwan entry policy, i need specifics regarding which part of the Korean Visa "number" is required. Can you point out which one? Thanks! Just got our approved certificates! Application was basically a matter of verifying details from our passport and the korean entry visa. After that the approval happened within minutes. Thanks a lot! Wow! 10 days would be perfect! My Taiwan trip was cheap compared to Hong Kong. I spent almost US$10 per day on train rides and food (street food at night market). So it actually depends on where you're going and where you'd eat plus if you do shopping (in my case, I don't do much shopping). Thank you for your reply. I've also heard that Hong Kong is way more expensive than Taiwan or other major Southeast Asian cities. Do you think 40 to 50k in my savings account would do? thank you so much, this has been verrrry helpful. was able to get a visa instantly for my aunt. Hi po ask ko lng po if pwde parin mg apply ng travel authorization cert of renewed na passport ko. For exanple po ngtravel aq last yr sa korea po. Sept2016. Kaso ngrenew po aq dis yr. Kukuha sna q ng TAC pra free visa pataiwan.pwde po kaya un kahit iba napassport # ko. Thank yoi. Hi! My family is planning to visit taiwan for the first time this summer vacation. We each have a single entry visa to korea but used in 2012. Are we eligible for the exemption? TIA! Hi. Is the expired Australian electronic visa be used for applying TAC? Thank you! Hi! I have a Korean Visa but I wasn't able to use it. 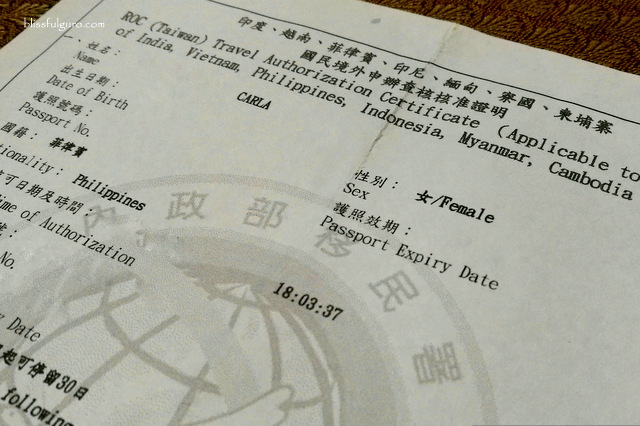 Can I still apply for a Taiwan Visa? Thanks! and @blissfulguro, do you have any information if unused visas were approved for tha TAC? Thank you so much! Hello, I have an approved TAC for Taiwan but I forgot that it is good for 3 months only. My flight to Taiwan is in December. Do you think I can still apply for another one and be approved again? Thanks ! The Koean VISA No. is the one with the PH followed by a seven digit no. (upper right corner) Disregard the 4-digit no. at the bottom. This is a verified info. directly from the Korean Embassy and it worked when I entered it for the TAC for Taiwan. Thank you blissfulguro for your blogs which are all useful tips. Keep on Sharing. Hello, in the visa application theres a part where i should put the details of my contact person in Taiwan. I booked airbnb and refused to provide his details and i understood. Does anyone here know what to put in there? Thank you so much. The only thing i know is my airbnb host calls himself Mr Su and i have his address and contact number but he refuse to provide his id number. I am still confused even after reading the comments. I have a single entry Japan visa, which was used and expired last year. Am I eligible for this certificate? Thank you. Hello. I am confused. What is the KOREAN VISA NUMBER to be used? The one with the PH or the Red Inked numbers? I entered the red ink numbers, my TAC was approved. Please help. I entered the red ink ones. And your TAC was approved so I guess everything's alright? Hello! I will travel to Taiwan this June 2017 as a tourist. I have a VISA from Korea and I googled which one is the VISA number from such VISA. Your blog came out emphasizing those "red numbers". By the way, I enjoyed reading your blog posts. I also followed you in your IG. Have a good day ahead! Hi gusto pmunta ng asawa ko d2 sa taiwan..pero passport lng meron sya.. Wla xa any travel s passport nya.. Pwede rin po b syng kumuha ng ROC certificate?? Hi! My TAC just got approved and it says that upon arrival in Taiwan, I should present the Korean Visa I referenced for my TAC application (along with the TAC itself + return ticket). However, I lost the passport containing the Korean Visa; I only have a scanned copy of it. Would you know if this would suffice? Thanks! Hi! I just printed out my TAC. Am I right that the application form only asked for the surname and given name? I didnt put my middle name though another is, my name has "Ñ" and I think the system does not accept other symbols that's why I just put "Nina" Thank you! Yes. You could Apply for Taiwan TAC even if your Japan visa is expired (up to 10 years after expiration date). Good Afternoon, May I ask if Taiwan embassy are very strict regarding the Bank statement of an applicant? like for example less than 30,000? Can they approve my Visa? or they can reject som applicants?